The High Ohm Tuning Fork Set is ideal for use in the energetic field around the body, and for clearing and resetting the energy of a room. The sound wave produced by the High Ohm Octave is soothing and therapeutic and can help restore balance to the energetic field around your body, thereby benefiting your physical body. These tuning forks are also recommended to help clear the energy of a particular space or room, making them ideal tools for home and professional use. 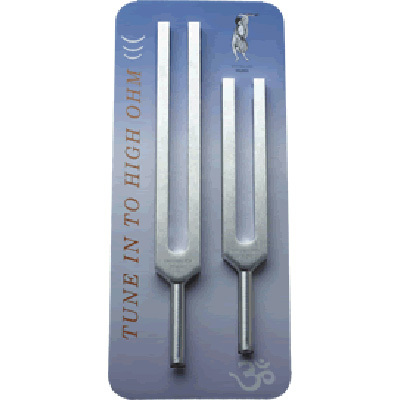 Use the High Ohm Tuning Forks in your treatments or yoga session, and while relaxing. Package includes two High Frequency Ohm Tuning Forks,(272.2 hz + 544.4 hz) plus information about the Rolling Technique, the Feng-Shui of Sound, and simple instructions for use.